The "laptop killer" of tablets has yet to emerge, but you can still configure a slate that puts your laptop out to pasture. With the tablet's lighter weight, longer battery life, and near-instant boot-up, the building blocks of a productivity engine are already there. When it comes to getting things done, Microsoft's Surface 2 and Surface Pro 2 tablets have one big advantage over the iOS and Android competition: namely, the Office productivity suite, which comes free with every Surface 2 and is, of course, available for the Surface Pro 2 as well. Both also have roomy (compared with other tablets) 10.6-inch displays. The Surface Pro 2, with its full Windows OS and ability to run desktop applications, just needs a Touch or Type Cover to make a mighty fine hybrid. But for the vast majority of us who have iOS and Android tablets rather than Surface slates, other productivity options are available. With the right apps and accessories, plus a few changes in how you work, your trusty tablet just might replace a conventional laptop. If you don't already own one, two great choices are Apple's iPad and Google's Nexus 10. The latter has a slightly larger screen, built-in NFC (near-field communication), and a lower starting price: $399 for the 16GB model, or $499 for 32GB. One thing to acknowledge from the outset: Working on a tablet does involve a few compromises, most notably a smaller screen. 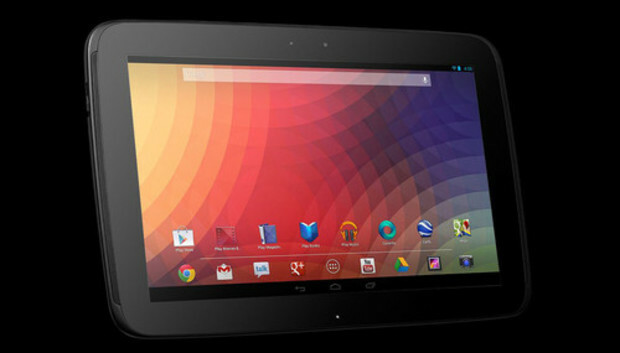 An iPad gives you just 9.7 inches of work area, while Google's Nexus 10 affords only a hair more (10 inches). That's considerably less space than you get from even a 13.3-inch laptop, something to consider if you work with a lot of spreadsheets or just need to accommodate less-than-stellar eyesight. On the flip side, both the iPad and the Nexus offer sky-high screen resolution: 2048 by 1536 pixels on the iPad 3 and later, and 2560 by 1600 pixels on the Nexus 10. You're not losing the capability for ultra-detailed work, you're merely doing it in a smaller area. Your choice of tablet will also dictate which accessories you can get, and that's an important consideration. For example, the Nexus 10 supports USB On-The-Go (aka USB OTG), which allows you to connect a wired keyboard or mouse or even a flash drive. The mouse in particular gives the Nexus 10 a huge advantage over the iPad, as it makes the tablet seem significantly more laptop-like. In word processing and spreadsheet apps in particular, it greatly eases the transition. It's a given that you'll need a keyboard. Both Android and iOS devices provide onscreen keys that suffice for quick notes, emails, and the like, but they consume nearly half the screen and lack tactile feedback. For any serious data entry, you'll want a physical set. iPad users can choose from a variety of third-party keyboards, many of which double as covers and carrying cases. Belkin and Logitech recently announced keyboard cases (in their Qode and Folio series, respectively) for the iPad Air, and various other manufacturers offer similar options for earlier models. These keyboards connect via Bluetooth and typically conform to the iPad's design, effectively creating a very seamless and laptop-like package.Nexus users will find fewer options. The MiniSuit Bluetooth Keyboard Stand Case and VSTN Aluminum Nexus 10 Keyboard Case, for example, both provide a hard-shell cover for the tablet and serve up QWERTY keys and a slot for propping the tablet at a comfortable viewing angle. If you don't need a form-fitting cover, just about any Bluetooth keyboard will work with the Nexus or any other tablet. For many users, software represents the biggest challenge in suiting up a tablet for work. Indeed, you'll need to take stock of the programs you run daily and figure out how many can be supplanted by app equivalents. Let's start with the biggie: Microsoft Office. Microsoft still doesn't offer the suite for Android or iOS (though CEO Steve Ballmer recently hinted that it's in the works), but plenty of ways to tackle documents, spreadsheets, and presentations on a tablet are available. For example, Google's Quickoffice suite--for both Android and iOS--offers basic document creation and editing, and it's file-compatible with Microsoft Office. It was originally priced at $15 (a steal compared with Microsoft Office on the desktop), but back in September, Google made Quickoffice free. The only catch is that you have to sync your documents with your Google Drive account. Quickoffice no longer supports Dropbox or any other cloud-storage service. If you'd prefer (or really need) Microsoft Office proper, CloudOn provides a virtualized copy of Office 2010, allowing you to create, edit, and share Word, Excel, and PowerPoint documents using the Office interface you're accustomed to. It's available in app form for both Android and iOS, and the basic service is free. However, it requires a live Internet connection--you can't run it offline. As for other desktop programs, you might be surprised how many apps can stand in. Adobe Reader, Dropbox, DocuSign, Evernote, Photoshop, RoboForm, Skype, Twitter--all have app counterparts for Android and iOS. Cisco's AnyConnect can help you get connected to your company VPN, and LastPass can make your desktop passwords accessible on your tablet. Can't find an app solution for some vital program? Consider keeping your laptop PC in the picture. Just leave it running back at the office, then use a remote-access app like LogMeIn to connect to and take control of the system from afar. Now you can run whatever programs you need to, just as if you were sitting back at your desk. The final piece of the puzzle: data. Resist the idea of actually copying all your Office files, PDFs, and the like from your laptop to your tablet. If you're mostly working online anyway, you're better off leveraging a cloud-storage service like Box, Dropbox, Google Drive, or SugarSync. In short order they'll sync any and all of your desktop files, then make them available via their companion apps on your tablet. And if you know you're going to need access to certain documents when you're offline, it's a simple matter to download them ahead of time. You'll definitely want to migrate your browser bookmarks as well. This is a cinch for Google Chrome users, as once you sign into the Chrome browser on Android or iOS, you'll find your favorites immediately synced. In fact, that could be the path of least resistance even if you use a different browser on your PC: Install Chrome, import your bookmarks from, say, Internet Explorer or Firefox, then run Chrome on your tablet and sync those bookmarks. As for email, it might be as simple as adding, say, your Gmail or Yahoo account to the stock Mail app in Android or iOS, or it might involve some monkeying with Exchange settings and perhaps even importing an Outlook PST file. PST Reader (Android) and Pst Mail (iOS) help you with the latter option, allowing you to view and search your messages. That said, if your company has an IT department, it may have solutions and/or policies in place for dealing with email on mobile devices. Start there. It's important to remember that a tablet can be more than just a replacement for your laptop--it can be an improvement. For example, with an app like CamScanner, you can use your tablet like a scanner, snapping photos of printed documents, converting them to raw text or PDFs, and filing them electronically. Evernote can be an incredibly powerful tool for tablet users, offering basic word processing and robust information capture and management, all coupled with simple syncing and sharing of data. Audiolio (iPad) lets you take notes and capture audio, creating time-synced bookmarks along the way, with an ease no laptop can match. WritePad can turn notes scribbled on your tablet screen (using a finger or stylus) into text, and the new Livescribe 3 pen can likewise send notes scribbled on actual paper directly to your iPad. It may take a little time to get accustomed to working on a tablet, especially for things like word processing and image editing. But once you start enjoying the benefits, you may never want to touch a laptop again.